This is part 1 of a series of blog posts about the development of the MS7 Synth. 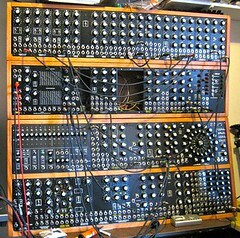 I love looking at and thinking about modular synths like the one above. With tons of wires, knobs, connectors and analogue electronics how could anyone not want one? The problem is that I’ve never been able to convince myself to shell-out what they cost. Various companies have come in and reduced prices but the cost of an “entry” system still typically more than $2000. If you are an enthusiast then those systems are good value but for a beginner or a casual user that is the kind of money that is hard to justify for a bit of fun. I wanted to build something that was cheaper but still capable. A modular synthesizer provides many different analogue electronic modules that can be joined together (“patched”) a multitude of different combinations to manipulate signals and generate sounds. When they first came out in the 1970s they achieved a cult following and massive modular synths became familiar in Prog Rock groups like “Emerson, Lake & Palmer”. Over time their popularity diminished partly as a backlash against the excesses of Prog Rock and partly due to integrated analogue synths like the Mini Moog and then the superior functionality of digital synths. More recently there has been a revival in interest in modular synthesizers and several new small companies have started making them. What drives this interest in a 40 year old technology when computers can synthesize any sound and emulate analogue beasts that few of us can afford? Partly it is a pull towards retro technology that isn’t just about a screen and keyboard. Partly it is the agreeable roughness of real analogue components. The behaviour of analogue modules drifts over time. When the get overloaded they start to fail in interesting ways. As an electronic engineer there is something fascinating about seeing an electrical signal jump around like a string being plucked. For me the physical environment of connected electronics provides the best place for serendipitous discovery of interesting effects and interactions. Most of the things I do with my analogue video synths would never have occurred in a digital environment. So I want an analogue synth and I want to be able to patch different combinations together. Where to get one that won’t break the bank? There are some nice projects bringing analogue synthesizers down to attractive price points. From the big names Korg have the wonderful Monotron. In the DIY ethos then Music From Outer Space have some cool gear. I like both those products a lot but the Monotron really needs more knobs and the Music From Outer Space kit needs more patch leads and is still more expensive then I really want. One of the things the British seem to be famous for is taking expensive electronic products and finding ways to create a new market at a much cheaper price point. When I was a kid it was all about the ZX81 and ZX Spectrum. These days everybody is going mad for the Raspberry Pi. In between we had ARM setting the industry standard in good-value CPUs. What all these products have in common is that they challenged assumptions about what was truly essential to their function. By focussing on the essentials and eliminating or simplifying the rest they reduced complexity and squeezed out cost. “Simplicate and add lightness” as Henry Ford is supposed to have said. Where would trying to simplify the modular synthesizer concept take me? Find out more in Part 2 coming soon.